This is an ancient document from before the World Wide Web. This information may be outdated, obsolete, and wrong. The Warper is a single lens projector that attaches to your computer monitor and allows you to enlarge and project images onto a wall, movie screen, white sheet, etc. The device should cost you less than $25.00. I will give only a general schematic for building The Warper. The design is quite simple and it will be easy for you to fit the design to your supplies and equipment size. The only special item that you will need is one large Fresnel lens. A Fresnel lens is a thin, floppy sheet of plastic that has the same optical properties as a glass lens many inches thicker. You may use a true glass lens. For our purposes we need a lens about 6 inches or more in diameter. A glass lens this size would be very heavy and expensive, but if you have one on hand then try to use it because it should give a better image. The following instructions assume that you will be using a Fresnel lens. You will need a lens about 6" x 6". You can make The Warper with a smaller lens, but it will be less effective. You can certainly use a larger lens. I give sources of inexpensive Fresnel lenses at the end of this text. Don't worry about focal length. For surplus and hobby grade equipment, take what you can get. A focal length of about 5 inches is fine. Often you won't even be told what the focal length is. Only the focus will have to be adjusted to compensate for the focal length of your lens. When you get your Fresnel lens, take it and your computer into a dark room. 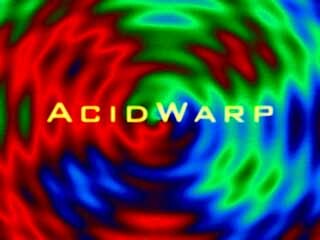 Start the Acid Warp program. Now Aim the computer monitor at a white wall, movie screen, white sheet, etc. The plane of the monitor screen should be roughly parallel to the plane of the projection surface. Now hold your lens in front of the computer monitor. The lens should also be roughly parallel to the projection surface and the computer monitor. As you vary the distance between the lens and the monitor you will be able to focus an upside-down image from the monitor onto the projection surface. The exact distance between the screen and the lens will vary on how far your monitor is from the projection surface and the focal length of your lens. For my setup, a wall is about 12 feet away and the lens is held about a foot from the screen. The image covers most of the wall. You may never be able to get the focus good enough to read text, but you should be able to easily read the Acid Warp title screen. Besides the wobbly image and arm strain this method is flawed for one technical reason. A lot of light leaks off to the sides of the lens and fills the room with stray light thus producing a washed out image. All that is necessary to fix this is to enclose the monitor is a black box with the lens as the only opening for light to escape. Here is the simple method that you can scale to your supplies and skill. You only need two cardboard boxes to make the black, light-tight box. Use wood, metal, or plastic if you want a fancy box. You will have to work out the details for those materials by yourself. For my first prototype I used liquor boxes that I got from a bar where I used to work. Champeign boxes are very sturdy. For your oxes one should fit inside the other. You may need to rip the side panel seam on one box and reglue it so that it is slightly smaller or larger. Fit is not critical, as long as the boxes are snug, yet slide easily. This telescoping action will allow you to focus. It's a good idea to paint the insides with flat black paint. If you don't paint the inside then the results will not be quite as good. Cut a hole for the lens in one end of the larger box and attach the lens over this opening. Remove the flaps from the other end of the box or fold. them in. If you fold them in then the bigger box will fit more snuggly around the smaller box. One end of the smaller box should have its flaps pulled open, but not cut off. These flaps fit over and around the monitor. Remove the flaps from the other end of the box. When complete, the flaps of the smaller box should be taped to the sides and top of the monitor. It does not matter if the fit is rough. The important thing is to make sure that very litle light escapes and that The Warper is held straight and steady on the front of the monitor. The larger box will fit over the smaller box and slide toward or away from the monitor screen. This will allow you to adjust the focus. You may need to put some blocks under the front (lens end) of The Warper to prevent it from sagging. I had no trouble with wine boxes. If you cannot move the lens close enough to the screen to get proper focus then simply trim a few inches off the edges of the open ends of the boxes where the smaller box meets to slide into the larger box. Your Warper is now ready for use! For best results: use a white projection surface; make the room very dark; turn up the brightness of your monitor. You may also need to adjust color. 3Dlens is a wholesaler of Fresnel lenses specifically targeting do-it-yourself projector hobbyists. Look for their #F550 lens -- high resolution, 320mm x 400mm, 5500mm focal length. AS&S sells a hodge podge of surplus items. Some of it is good, some of it is junk. When you get their catalog, look for the "Optics" section. Edmund Scientific Co. sells quality optics as well as hobby materials. When you get their catalog, avoid the Optics section (unless you want to pay $30.00 for a 6" x 7" lens.) Look in the index under "fresnel" or "lenses". There should be some lenses referenced in the hobby section of their catalog. There, find a listing for an 8.5" x 11" lens for about $7.95. They also sell a 7" x 10" lens for about $5.95. This is the size I originally used. H&R Co. sells surplus and new equipment for science and industry. They sell single multipurpose glass and fresnel lenses in large sizes. Macrocoma sells a fresnel lens for about $15.00. Ask for "The Master Lens". NOTICE! Use this hardware at your own risk! Noah Spurrier does not accept reposibility for damage to persons or property that comes from the use or installation of this hardware. Use this hardware at your own risk!